The International Astronomical Union (IAU) deliberated lengthily on the definition of planets during its 26th general assembly held in Prague from 14 May to 25 August 2006. It was becoming a pressing issue that the naming of objects should reflect all the bodies that our current instruments are capable of detecting in the solar system, their names having been practically unchanged since ancient times, when etymologically, the word "planet" designated any "vagabond" in the sky, i.e. points of light that moved relative to the stars. Therefore, the International Astronomical Union decided to divide the bodies in our solar system into three distinct main categories. c. has cleared the neighbourhood around its orbit. d. is not a satellite. 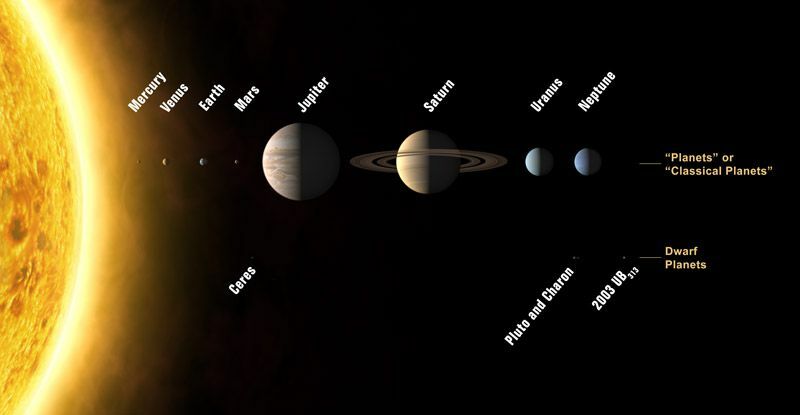 3 - All the other objects3 in orbit around the Sun, except for satellites, are called "small solar-system bodies". Note that in compliance with the above definition, Pluto is placed in category 2, among the "dwarf planets", and is therefore the prototype of a new category of trans-neptunian objects which, since June 2008, have been called plutoid. Note also the absence of any definition of planetary objects revolving around other stars (exoplanets or extrasolar planets). The International Astronomical Union probably simply preferred not to make any pronouncement in the absence of a precise and complete description of the systems observed up to now, and to wait until we have enough data to apply the newly approved definitions. (1) - The eight planets are: Mercury, Venus, Earth, Mars, Jupiter, Saturn, Uranus and Neptune. (2) - A specific action will be organised by the IAU to decide to which category — "dwarf planet" and/or other categories — limit cases belong. (3) - This includes most of the asteroids in the solar system, most of the trans-neptunian objects (TNO), comets and all other bodies.